Your IBM sales representative will create an account for you to access the ECDN Management Portal during the evaluation phase. If your company already has an ECDN account, then you may ask your local team responsible for the video delivery infrastructure which includes ECDN, to create a new ECDN portal login account for you. Your login must have Admin or SuperAdmin role privileges to setup ECDN servers. Learn more about ECDN user roles. Once you have your login credentials, you can log in at https://ecdn.deepcaching.com. To start using the ECDN services, you will need to collect the following information, so that you can efficiently complete the configuration in the ECDN Management Portal, in order to deploy the server instances. Create a list of locations where ECDN servers will be deployed. Assign a unique and descriptive name to each location that will help you identify it later (example: “San Francisco Office”). You can start deploying your first ECDN server instance with one location already. For each location, add the external IP address range that is assigned to it in your enterprise. You will need to contact your network administrator for this information. To create an ECDN server instance, you will need to specify its network settings that ensure that the server has outbound connectivity to the Internet. For servers that have static IP address you will need the local IP address, netmask, gateway and DNS server settings. Another important requirement for the proper operation is configuring time synchronization of the server correctly, i.e. setting NTP servers. You will also need access to a hypervisor host for your ECDN server instance. We support VMware ESXi, Microsoft Hyper-V and Oracle VM VirtualBox hypervisors. You can start with the following configuration for one server instance: 4 CPUs, 4 GB of memory, 4 GB of disk space. The host hypervisor should have at least 1 Gbps network connectivity. (See detailed system requirements). ECDN servers require network connectivity to the ECDN backend services. You need to validate this by ensuring that the endpoint https://api.deepcaching.com is accessible from the intranet network in which the ECDN servers will be deployed. In order to broadcast or view streams, you will need to ensure that any firewall is configured to allow traffic on specific ports and from specific IP address ranges. A firewall can reside on your local machine, on your router, or as part of your corporate network. We describe each step in more details in following sections. Access the ECDN Management Portal using your login credentials. Your starting page is the list of your locations that will be empty upon your first login. Click the Add new location button, it will open the form where you can define the new location. Enter a unique name for the location. Set parent (if this is a child location). Enter the external IP addresses/address ranges you want to enable ECDN traffic for. Click the Add button to save your settings and create the location. If enabled, clients can request content from external CDNs if the pre-defined ECDN edges are unavailable or fail to deliver content. If disabled, internal clients will use ECDN servers only for downloading the video streams. Note: Too many clients connecting to external sources can cause overload on the corporate Internet connection. In case all the ECDN servers become unavailable and the external CDN fallback is disabled, the playback will be interrupted until an ECDN server becomes available and operational again. 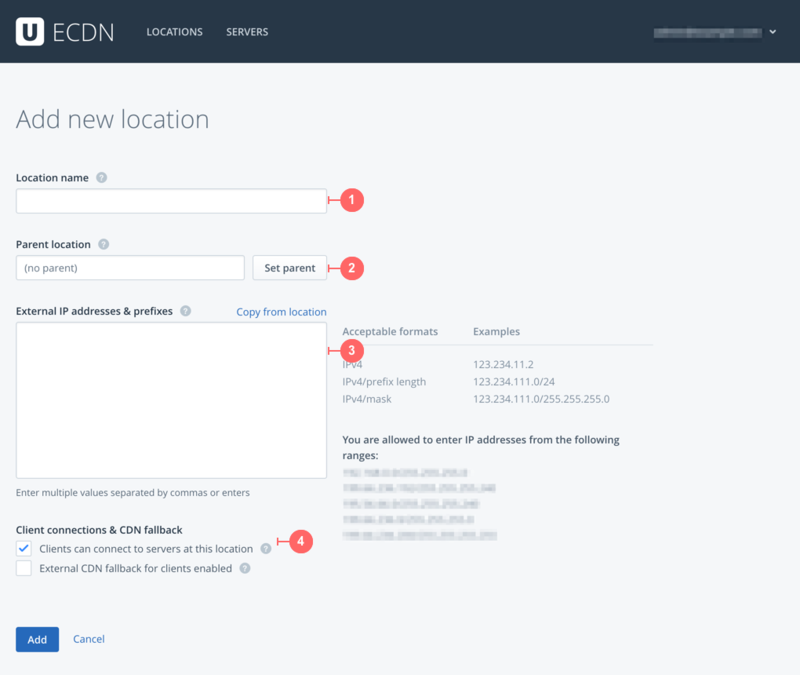 You can start configuring your first ECDN server instance with one location already, but you can also add multiple locations before deploying ECDN servers. After you have added at least one location, the Add new... button will appear above the list of locations, from where you can repeat the above steps to add all your locations. You can also create a multi-tier structure of locations that will define upstream and downstream servers in your corporate network. After you have created your locations, you are ready to configure your ECDN servers. To add a new server, navigate to Your servers (click Servers in the page header) and click the Add new server button. Clicking the Add new server button will display the page where the server configuration is a step-by-step process. After you have entered all required information, you will be able to download a virtual CD with the configuration file, as well as the required disk image for your hypervisor to deploy your ECDN server. For detailed information on the configuration, see How to configure an ECDN server. After you have configured your hypervisor host, and downloaded the appropriate files, you can start deploying the ECDN server instance. Go to your ECDN Management Portal and check the status of the ECDN server you have just deployed. 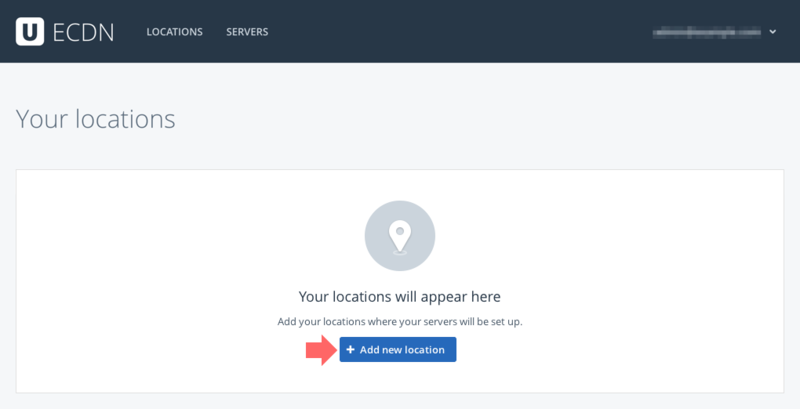 Navigate to the list of your servers by selecting Servers in the top navigation. Locate the recently deployed ECDN server in the list, and click to open its detailed view. In the detailed view, you can check the “Health status” of the server, as well as the status various service daemons running on the instance. Performance metrics are displayed as charts that show values for the past 6 hours.